Alciato at Glasgow: Emblem: In temerarios. Contre les temeraires. Ignivomos ausum flectere Solis equos? Est temerè insesso lapsus ab axe miser. Cunctorum poenas denique dant scelerum. You see here Phaethon, driving his father's chariot, and daring to guide the fire-breathing steeds of the Sun. After spreading great conflagrations over the earth, the wretched boy fell from the car he had so rashly mounted. - Even so, the majority of kings are borne up to heaven on the wheels of Fortune, driven by youth's ambition. After they have brought great disaster on the human race and themselves, they finally pay the penalty for all their crimes. dem se & suos in praecipitium miserè coniiciant. Il embrasa la terre, & la mit toute en cendre. Ambitieux qu’ils sont, & d’ardeur trop soudaine. Ils sont payez en fin, & en portent la peine. 1. Phaethon, the son of Apollo, the sun-god. The myth referred to here is told in Ovid, Metamorphoses 1.748 - 2.349. 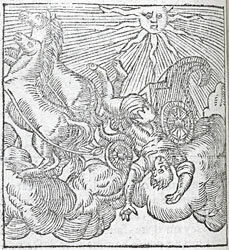 Both Phaethon and Icarus (see [FALc103]) are types of those who aim too high and do not recognise their proper sphere. See also [FALc056].